The Seafood CRC’s Education and Training Program has a strong end-user focus and needs to ensure “industry ready” graduates enter the Australian seafood industry at the completion of their candidature. The desire to develop the capabilities of both young researchers and industry participants is a strong and major driving force in the Seafood CRC. As such, research students and post doctoral research scientists (termed early career scientists in this report) will be part of a program that enhances their pathway into further seafood research or industry careers. 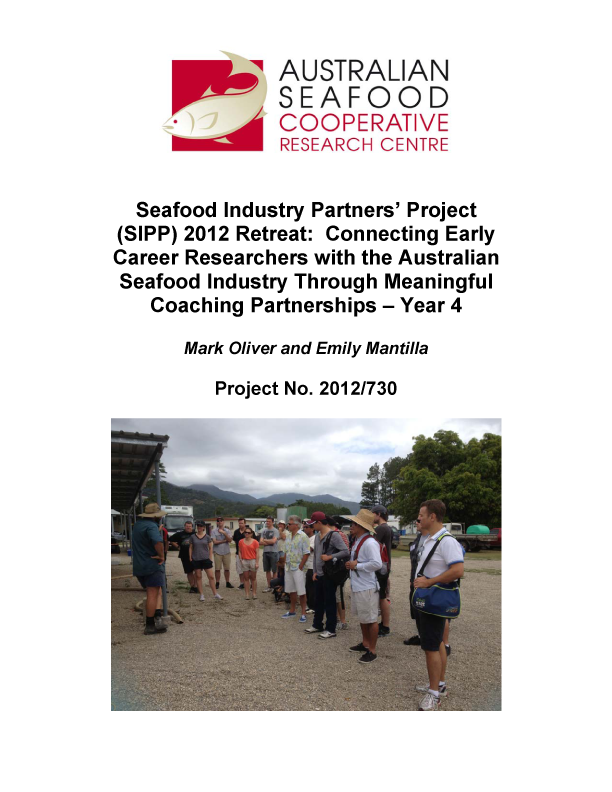 This program is called the Seafood Industry Partners Project (or SIPP) and usually takes the form of a yearly training “retreat”. SIPP 2012 allowed participants to gain an insight into the area of “business” which is not traditionally explored by young academics (particularly scientists). The goal was to empower participants with a greater appreciation and holistic understanding of owning and or managing a business in the Australian seafood industry. This was achieved through the development and implementation of an intensive two day business pitch workshop as well as visiting two successful commercial aquaculture facilities that have diversified from standard production into other positive revenue streams.